The amount of sea ice in the Arctic is at an all-time low, suggesting that climate change is leading to a dramatic shift in the north, according to a new report from the National Snow and Ice Data Center. The amount of sea ice in the Arctic is at an all-time low, suggesting that climate change is leading to a dramatic shift in the north, according to a new report. 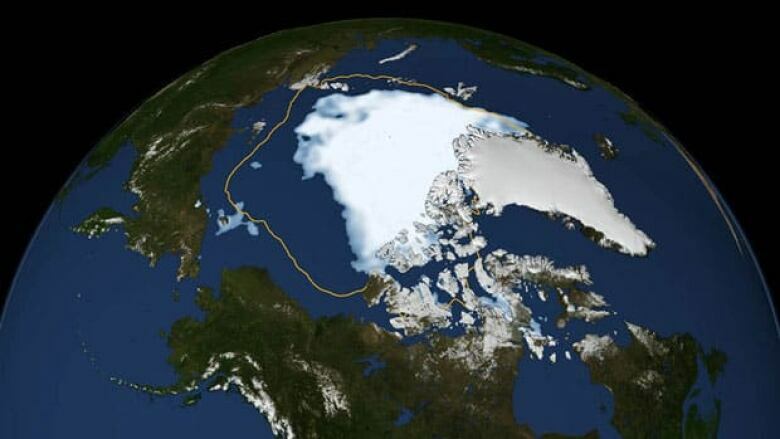 In an analysis released this week, the U.S.-based National Snow and Ice Data Center (NSIDC) said that Arctic sea ice cover has melted to a record low, breaking the previous record set in 2007. Satellite data from August 26 showed that sea ice extent fell to 4.10 million square kilometers, the lowest amount ever seen since observations of the polar cap began three decades ago. On September 18, 2007, the date of the previous record low, sea ice extent was measured at 4.17 million square kilometres. "By itself it's just a number, and occasionally records are going to get set," said NSIDC scientist Walt Meier. "But in the context of what's happened in the last several years and throughout the satellite record, it's an indication that the Arctic sea ice cover is fundamentally changing." The six lowest ice levels on record have occurred in the last six years, the report noted. Every summer the Arctic ice cap melts down to what scientists call its "minimum" before colder weather builds the ice cover back up. With two to three weeks left in the summer melt season, scientists expect that this year’s minimum ice extent could fall even lower. NSIDC will release a full analysis of the melt season in early October. Arctic sea ice cover has been in a long-term decline, falling about 13 per cent per decade, a figure scientists say is a strong signal of global warming. "I think we’re going to see in the not too distant future is that areas like the North Pole will even become ice-free briefly in summer," said Ted Scambos, lead scientist at NSIDC, adding that the Arctic Ocean could become ice-free by 2030. The NSIDC findings echo measurements taken earlier this month by the European Space Agency, suggesting that the thinning of Arctic ice is progressing 50 per cent faster than many polar scientists had previously predicted. It pointed to global warming and rising greenhouse gases as possible contributing factors. The declining ice may affect fish and animal populations in the north, according to the World Wildlife Federation. "Migrating whales, migrating birds may arrive in the Arctic at a time when there's really not as much life to sustain them as there would have been in previous times," said Clive Tesar of the WWF Arctic Initiative. People living in Canada’s northern communities, who rely on local fauna, are already feeling the impact of the changing environment and are being forced to adapt. Lawrence Amos, a hunter in N.W.T., said that there used to be sea ice year-round surrounding Banks Island, on the cusp of the Arctic Ocean. But lately, once the ice melts in June, it doesn’t return until the fall. This is leading to fewer seals and sea animals in the area, preventing people from hunting and fishing as often as they used to, Amos said. "We have to buy more store-bought food and that changes our diet," Amos said. "Stuff like that costs a lot of money."